1870, zelkova, Cheon Chu City, Cheon Ra Buk Do Province. 35″ w, 12.75″ d, 42.5″ h.
Cheon Chu City is known to have produced some of the finest furniture in Korea because this was the financial center of Korea with a rich merchant class, and also the city where members of the wealthy land-owning Yangban class gathered to prepare to take an open Imperial Eamination the passing of which guaranteed upward mobility. While waiting, this already wealthy class of people could afford to commission quality furniture for their mansions. The high quality of this chest is shown by the use of zelkova, a wood highly valued in Korea and Japan, and a lot of thick ironwork but restrained in design, in keeping with the Neo-Confucianism literati’s flavor of always attempting ” to reduce artifice to a minimum with intention of making the most of the material used”. The zelkova wood shows beautiful grains that the quiet metalwork carved with symbolic motifs complements. It projects a frontal profile of simplicity and elegance. This is a double chest but is in one piece. 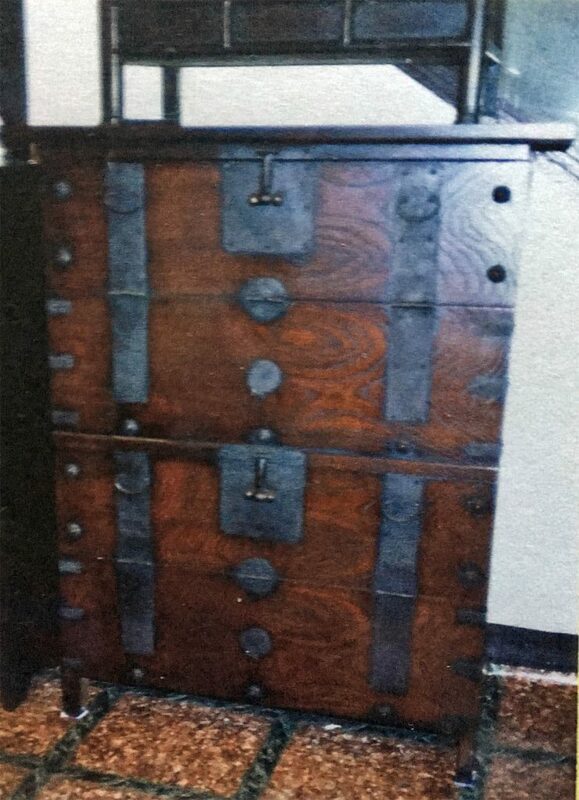 The chest was used for storing clothes. It has a certificate of authenticity by a Korean Professor of Korean History and Antiquity, one of only thirteen certifiers approved by the Korean government in the 1900s. ( The photo is from a certificate as the piece is in storage).